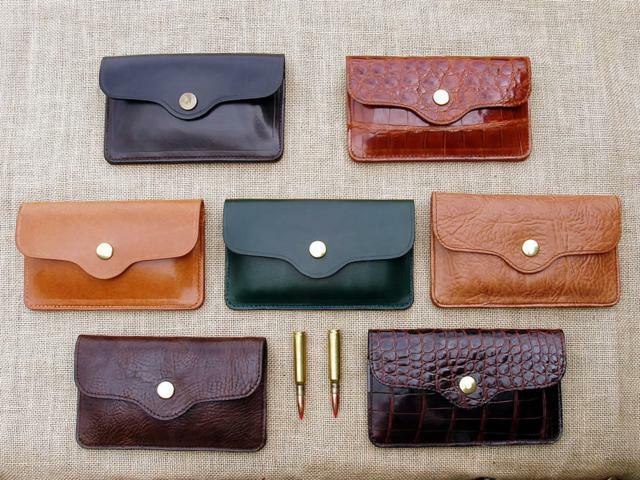 This purse shaped pouch takes 4 bullets in calibres from .22-250 up to and including 9.3 X 74R and .375 H and H. , .243, .308. .275 .300 win mag etc all fit perfectly as they do in the large pouch. We always have a lot of bullet pouches in stock because I like making them! It all started about 15 years ago whilst attempting to connect lead and very fast fur in a large French Forrest I loved it – at the beginning of the day I was given a sidelock Browning in 9.3 x 74R and a beautifully made bullet pouch filled with bullets the size of fountain pens and told to go and fire at a cardboard box 30 yards away. I cant remember if I hit the box, but I was hooked on pig shooting and must have done OK as I was allowed to take the bullet pouch home to copy. On subsequent french trips I gave these bullet pouches to various hosts and they all commented on their quality. These pouches have a double back which allows you to slide them onto a belt, but I think its real place is in your pocket . 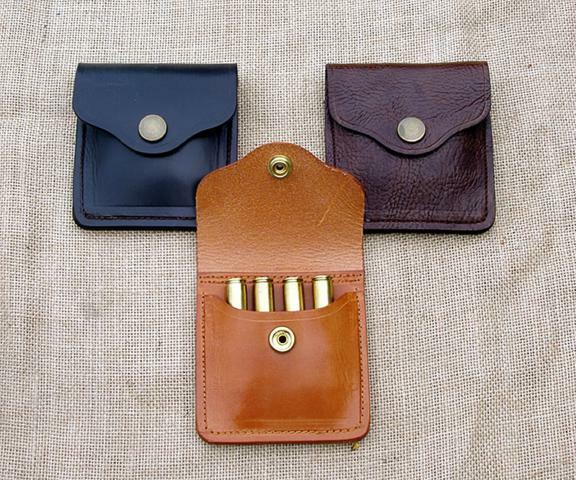 We also make make an express version of this pouch which takes .416 Rigby, .470 etc. 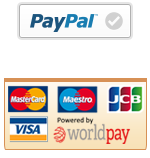 If you are a big bore man then you will know that the Rigby bullet is the longest of the big chaps and therefore any other express bullet will fit. Because the bullet retaining loops are leather they are flexible and will accommodate those larger diameter ( .577 etc ) bullets. Materials; this is the fun part – we used to make them only in light or dark havana brown best Sedgewicks bridle hide and it is very nice to receive glowing praise for these pouches made in this very classic waxed hide. 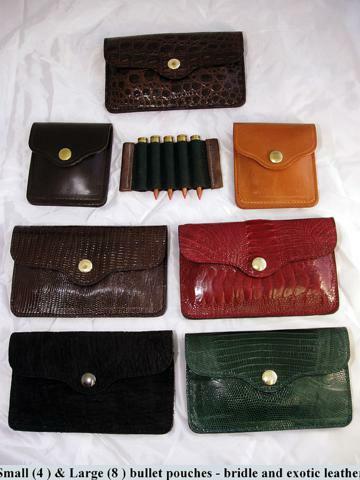 But I couldn’t help myself and as I speak we have in stock pouches in Sedgewicks Light and Dark Havana, Mid Green Cowhide, Lightweight Light and Dark Havana Grained Cowhide, Black Elephant Hide, Bottle Green and Dark Brown Tejun Lizard, Claret Ostrich Thigh Hide and Dark Brown Crocodile. However I am sure that at a Game Fair someone is going to say that there is nothing to suit him!